Film director Kanittha Kwunyoo took part in a discussion about censorship and artistic freedom earlier today at BACC in Bangkok. 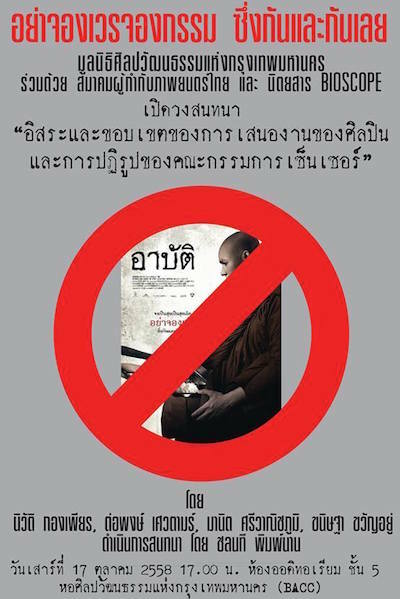 อย่าจองเวรจองกรรม ซึ่งกันและกันเลย was held in response to the banning of Kanittha's new film Karma. 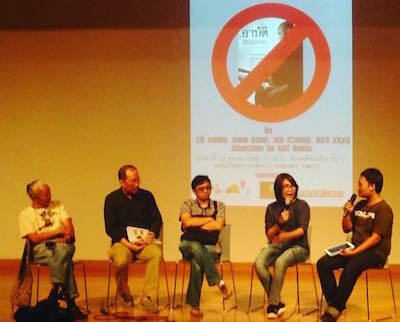 BACC organised two similar events in 2013: Freedom On Film (a seminar on film censorship) and งานมอบรางวัลหนังน่าจะแบน (a festival of films that tested the limits of Thai censorship). Kanittha revealed that she had received abusive messages from some monks who hoped that she would die. She explained that, following the ban, she had cut three minutes from the film, and that this shortened version had been passed by the censor.